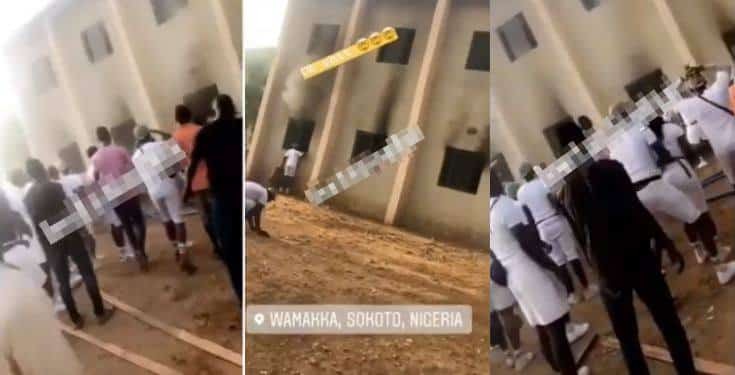 A video has emerged online showing how a fire outbreak engulfed a building at the NYSC camp on Sokoto, causing serious pandemonium afterwards. Local reports show that the sad incident happened today, April 3, 2019. The cause of the fire outbreak is not certain but it is believed that an electrical fault is what sparked it. The NYSC members were all out when the fire started and everyone rushed back to put it out. However, because of the intensity, they could only watch from outside for a while. Many corp members lamented that their credentials were in the building when the fire broke out and these papers may have been burnt. It is believed that the fire has been put out at the time of this report.